Most of Macs sold are mobile machines and as a mobile machine we tend to use them when plugging in isn’t convenient. Battery health is an important part of mobile computing. If you don’t have access to power and your battery is dead there isn’t much point in having the laptop. There are a few ways to check the health of your battery. Third party apps, and built in apps in OS X. First I will start with the third party free ware apps. 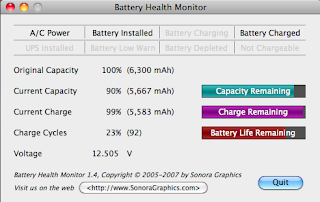 Battery Health and Status Monitor from SonoraGraphics http://www.sonoragraphics.com/batteryhealth.html is a great freeware program that will tell you about your batteries original capacity, current capacity and charge cycles. This gives you a great quick overview of how your battery is doing and if it might need to be replaced. and click on the battery you will get additional information about your battery. In this case it adds Condition and tells you what the status of your battery. The third place you can check for that status of your battery is System Profiler. Open your System Profiler and click on Power and it will tell you everything about the status of your battery and power management settings. If the indicator tells you to replace the battery or it is in a status other than Normal and you have fewer than 300 Charge Cycles on the battery take it into an Apple Store or call Apple Technical Support. they may replace your battery if it is defective. The newer model laptops batteries are typically good for 1000 charge cycles while the older machines are usually good for about 300 charge cycles. I replace my battery typically every two years to maximize my battery life. Now you can get an external power pack with a mag safe connector to allow you to run your laptop between 11 and 26 hours depending on model laptop and model of HyperMac http://www.hypershop.com/HyperMac-External-MacBook-Battery-and-Car-Charger-s/91.htm you are using. It can also recharge iPhones and other USB devices. I know the Mac Geek Gab is doing a little battery survey so pop on over and participate in the survey http://www.macobserver.com/tmo/article/mac_laptop_battery_life_survey/?utm_campaign=shorturl it will be interesting for us to find out how these batteries really work. The MacGourmet Deluxe is iTunes for recipes. It is a easy to use Kitchen Management System for the rest of us. With a few simple controls across the top of the Window and a simple search bar allowing a search on any or all fields to find the recipe you are looking for just like your music. This is a very powerful and easy to use tool for storing recipes, planning menus, building cookbooks, managing nutrition or anything else an amateur or professional epicurean can dream up. With user created Recipe Books and Smart Recipe books you can store your recipes in any way you like or have the computer keep track of recipes based on the criteria you set. One of the default smart recipes books is Recipes I Have Prepared. So you can mark an item as prepared so you can track what you have made in the past. MacGourmet comes with some recipes already built in and you can always add your own recipes or click on the Featured section to find new recipes from Mac.Gourmet.com. If you find a recipe on the web you like. Just highlight it, click Services, Mac Gourmet, and Make a Text Clipping and the whole recipe is immediately stored in your Clippings folder and can be imported as a recipe card any time. The import is not an automatic process it requires highlighting sections of the clipping and identifying it to the application but at least you don' have to retype anything. The application also includes the ability to store notes about foods and wines you have eaten, keep historical shopping lists and make notes on where you can pick up those hard to find items. This program is a gastronomic diary for the food and drink lover in you. MacGourmet also supports the creation of shopping lists based on the recipes you select so you can just pick your recipes print your shopping list and head out to the store. This makes the shopping task much simpler if you sit down and use the built in meal planner, you can plan your meals, build your shopping list and access the recipe when you need to prepare the meal all in one easy place. For an additional $4.99 you can also add the iPhone or iPod touch application to your phone and share the recipes and lists between your desktop and handheld device. I think for deluxe they should include the iPhone app for free. MacGourmet also lets you share your recipes on your MobileMe website right out of the application or send the recipe to friends via email. There is Bonjour sharing component built in for those who have multiple Macs at home and you want to share recipes between them. Once you are ready to head to the kitchen you have a few options. The iPhone or iPod Touch add on app for $4.99, print the recipe on paper, or take your laptop to the kitchen and click on the Chef View. This gives you a large print view you can read at a distance to keep your Mac clear of the work area and out of harms way while still making the recipes readable at a distance. 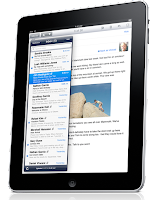 The application has a lot of power available but it does have a few shortcomings. All of this data is of course stored locally on your PC but doesn't include a conduit for MobileMe syncing of its database. So make sure you use a backup program so you don't loose your recipes and notes in the event of disaster. Not including the iPhone app is a little disappointing. I would love to be able to plan a meal and send the shopping list right to my iPhone or the iPhone of whomever is doing the shopping. Not being able to send the list directly to email is a bit of a let down as well. Mac Gourmet could benefit from some additional online access to list and store new recipes. Perhaps Amazon could add some e-cookbooks for a low price to add to collections as well as a free downloadable web standard for recipes so surfers can just click and cook. This app is flexible and allows you to use as many or as few of the features as you like. It is only limited by the imagination and training of its user. I know this tool is a must have for this tech geeks kitchen. Easy to use familiar interface, lots of great features for the diet conscious, and comes with some great tasty recipes. The iPhone App should be free for deluxe users, Easier import method for online recipes, a scanning feature to scan in existing paper recipes are definitely lacking.